This article is about the human Y-DNA haplogroup. For the human mtDNA haplogroup, see Haplogroup O (mtDNA). M175 (+ numerous other SNPs). Haplogroup O, also known as O-M175, is a human Y-chromosome DNA haplogroup. It is primarily found among populations in Southeast Asia and East Asia. It also is found in populations of Russia Far East, South Asia, Central Asia, Middle east, Oceania, Madagascar, and the Comoros. Haplogroup O is a primary descendant of haplogroup NO-M214. 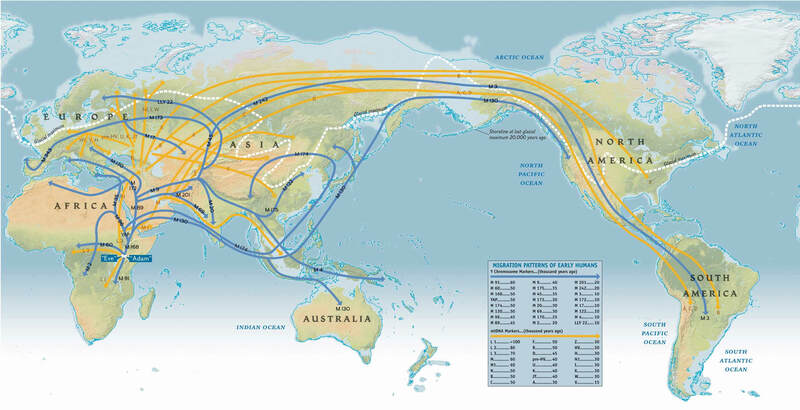 The O-M175 haplogroup is very common amongst males from China, Korea, and Southeast Asia. It has two primary branches: O1 (F265) and O2 (O-M122). O1 is found at high frequencies amongst males native to Southeast Asia, Taiwan, Japan, the Korean Peninsula, Madagascar and some populations in southern China and Austroasiatic speakers of India. It's also high in the Solomon Islander and significant frequencies in some populations Papua New Guinea. O2 is found at high levels amongst Han Chinese, Tibeto-Burman populations (including many of those in Yunnan, Tibet, Myanmar, Northeast India, and Nepal), Manchu, Koreans, Vietnamese, Malays, Polynesians, and some populations in the Philippines. It is also found significantly in Central Asia, especially among the Kazakh Naiman tribe, among whom it reaches one of its highest frequencies anywhere. It is also found with notable frequency among the Khalkha Mongols and among Kazakhs in the Altai region. Haplogroup O-M175 is a descendant haplogroup of Haplogroup NO-M214, and first appeared according to different theories either in Southeast Asia (see Rootsi 2006, TMC & ?, Shi 2005, and Bradshaw & ?) or East Asia (see ISOGG 2012) approximately 40,000 years ago (or between 31,294 and 51,202 years ago according to Karmin et al. 2015). Haplogroup O-M175 is one of NO-M214's two branches. The other is Haplogroup N, which is common throughout North Eurasia. This haplogroup appears in 80-90% of most populations in East Asia and Southeast Asia, and it is almost exclusive to that region: M175 is almost nonexistent in Western Siberia, Western Asia, Europe, most of Africa, and the Americas, where its presence may be the result of recent migrations. Certain subclades of Haplogroup O-M175 do achieve significant frequencies among some populations of South Asia, Central Asia, and Oceania. Significant presence of Haplogroup O-M50 have been found in Bantu-speaking populations of the Comoros along with a single instance of O-MSY2.2(xM50) while both O-M50 and O-M95(xM88) occur commonly among the Malagasy people of Madagascar. O-M175 have been found in 28.1% of Solomon Islander from Melanesia. Among the sub-branches of haplogroup O-M175 are O-M119(O1a), O-M268(O1b), and O-M122(O2). A broad survey of Y-chromosome variation among populations of central Eurasia found haplogroup O-M175(xM119,M95,M122) in 31% (14/45) of a sample of Koreans and in smaller percentages of Crimean Tatars (1/22 = 4.5%), Tajiks (1/16 = 6.25% Dushanbe, 1/40 = 2.5% Samarkand), Uyghurs (2/41 = 4.9%), Uzbeks (1/68 = 1.5% Surkhandarya, 1/70 = 1.4% Khorezm), and Kazakhs (1/54 = 1.9%) (Wells 2001). However, nearly all of these Korean O-M175(xM119,M95,M122) Y-chromosomes may belong to Haplogroup O-M176,[Note 1] and later studies do not support the finding of Paragroup O-M175(Xue 2005, Kim 2011). O-M175(xM119,M95,M122) Y-chromosomes that have been found among these populations might therefore belong to Haplogroup O-M268*(xM95,M176) or Haplogroup O-M176. A study published in 2013 found O-M175(xM119, M95, M176, M122) Y-DNA in 1/18 Iranians from Teheran, 2/37 Tajiks from Badakhshan Province of Afghanistan, and 1/97 Mongols from northwest Mongolia, while finding O-M176 only in 1/20 Mongols from northeast Mongolia. O1a-M119 and O1b-M268 share a common ancestor, O-F265 (a.k.a. O-F75) approximately 23,400 [95% CI 21,600 to 25,300] YBP. O-F75, in turn, coalesces to a common ancestor with O3-M122 approximately 24,700 [95% CI 23,000 to 26,500] YBP. Thus, O-F75 existed as a single haplogroup parallel to O3-M122 for a duration of approximately 1,300 years (or anywhere from 0 to 4,900 years considering the 95% CIs and assuming that the phylogeny is correct) before breaking up into its two extant descendant haplogroups, O1-MSY2.2 and O2-M268. O-M119 (which was known briefly as O-MSY2.2, until the SNP MSY2.2 was found to be unreliable) is found frequently in Austronesian-speaking people, with a moderate distribution in southern and eastern Chinese and Tai–Kadai peoples. O-M111/M88 Found frequently among Hani, She people, Tai peoples, Cambodians, Kuy, Htin in Northern Thailand, and Vietnamese, with a moderate distribution among Qiang, Yi, Hlai, Miao, Yao, Taiwanese aborigines, and Han Chinese. O-M176(x47z): Found frequently among Koreans, with a moderate distribution among Buryats, Daurs, Evenks, Hezhe, Indonesians, Japanese, Manchus, Micronesians, Ryukyuans, Sibe, Thais, Udegeys, and Vietnamese. O-47z: Found frequently among Japanese and Ryukyuans, with a moderate distribution among Indonesians, Koreans, Manchus, Thais, and Vietnamese. Found frequently among populations of East Asia, Southeast Asia, and culturally Austronesian regions of Oceania, with a moderate distribution in Central Asia (Shi 2005). O-M134: Found frequently among Sino-Tibetan peoples, among members of the Kazakh Naiman tribe with a moderate distribution throughout East Asia and Southeast Asia. O-M7: Found frequently among human remains associated with the Neolithic Daxi culture and modern Hmong–Mien, Katuic, and Bahnaric peoples, with a moderate distribution among Han Chinese (Xue 2006), Buyei (Xue 2006), Bai (Wen 2004), Mosuo (Wen 2004), Tibetans (Wen 2004), Qiang (Xue 2006), Oroqen (Xue 2006), Tujia (Su 2000), Thai (Su 2000), Orang Asli (Su 2000), western Indonesians (Su 2000 and Kayser 2008), Malaysians (Kayser 2008), Vietnamese (Kayser 2008), and Atayal (Su 2000). Haplogroup O is associated with populations which speak Austric languages. The following is a phylogenetic tree of language families and their corresponding SNP markers, or haplogroups, sourced mainly from Edmondson 2007 and Shi 2005. This has been called the "Father Tongue Hypothesis" by George van Driem (vanDriem 2011). It does not appear to account for O-M176, which is found among Japanese, Korean, and Manchurian males. Prior to 2002, there were in academic literature at least seven naming systems for the Y-Chromosome Phylogenetic tree. This led to considerable confusion. In 2002, the major research groups came together and formed the Y-Chromosome Consortium (YCC). They published a joint paper that created a single new tree that all agreed to use. Later, a group of citizen scientists with an interest in population genetics and genetic genealogy formed a working group to create an amateur tree aiming at being, above all, timely. The table below brings together all of these works at the point of the landmark 2002 YCC Tree. This allows a researcher reviewing older published literature to quickly move between nomenclatures. ^ O-M175(xM119,M95,M122) is sometimes incorrectly called "O*". ^ The outlier Kadai branch is called "Kra" by Thai linguist Weera Ostapirat and "Geyang" by Chinese linguists. ^ a b G. David Poznik, Yali Xue, Fernando L. Mendez et al. (2016), "Punctuated bursts in human male demography inferred from 1,244 worldwide Y-chromosome sequences." Nature Genetics 2016 June ; 48(6): 593–599. doi:10.1038/ng.3559. ^ a b c Yan, Shi; Wang, Chuan-Chao; Zheng, Hong-Xiang; Wang, Wei; Qin, Zhen-Dong; Wei, Lan-Hai; Wang, Yi; Pan, Xue-Dong; Fu, Wen-Qing; He, Yun-Gang; Xiong, Li-Jun; Jin, Wen-Fei; Li, Shi-Lin; An, Yu; Li, Hui; Jin, Li (2013). "Y Chromosomes of 40% Chinese Are Descendants of Three Neolithic Super-grandfathers". PLoS ONE. 9 (8): e105691. arXiv:1310.3897. Bibcode:2014PLoSO...9j5691Y. doi:10.1371/journal.pone.0105691. ^ Msaidie, Said; et al. (2011). "Genetic diversity on the Comoros Islands shows early seafaring as major determinant of human biocultural evolution in the Western Indian Ocean" (PDF). European Journal of Human Genetics. 19 (1): 89–94. doi:10.1038/ejhg.2010.128. PMC 3039498. PMID 20700146. Retrieved 1 October 2016. ^ Hurles, Matthew E.; Sykes, Bryan C.; Jobling, Mark A.; Forster, Peter (2005). "The Dual Origin of the Malagasy in Island Southeast Asia and East Africa: Evidence from Maternal and Paternal Lineages". American Journal of Human Genetics. 76: 894–901. doi:10.1086/430051. PMID 15793703. ^ Tofanelli, Sergio; Bertoncini, Stefania; Castrì, Loredana; et al. (September 2009). "On the Origins and Admixture of Malagasy: New Evidence from High-Resolution Analyses of Paternal and Maternal Lineages". Molecular Biology and Evolution. 26 (9): 2109–2124. doi:10.1093/molbev/msp120. PMID 19535740. ^ Cox, Murray P.; Mirazón Lahr, Marta (2006). "Y-chromosome diversity is inversely associated with language affiliation in paired Austronesian- and Papuan-speaking communities from Solomon Islands". American Journal of Human Biology. 18 (1): 35–50. doi:10.1002/ajhb.20459. PMID 16378340. ^ Gregory R Magoon; et al. (2013-11-22). "Generation of high-resolution a priori Y-chromosome phylogenies using "next-generation" sequencing data". bioRxiv 000802. ^ Yan, Shi; Wang, Chuan-Chao; Li, Hui; Li, Shi-Lin; Jin, Li; Schurr, Theodore G; Santos, Fabricio R; Quintana-Murci, Lluis; Bertranpetit, Jaume; Comas, David; Tyler-Smith, Chris; Zalloua, Pierre A; Balanovska, Elena; Balanovsky, Oleg; John Mitchell, R; Jin, Li; Soodyall, Himla; Pitchappan, Ramasamy; Cooper, Alan; Matisoo-Smith, Lisa; Royyuru, Ajay K; Platt, Daniel E; Parida, Laxmi; Blue-Smith, Jason; Soria Hernanz, David F; Spencer Wells, R (2011). "An updated tree of Y-chromosome Haplogroup O and revised phylogenetic positions of mutations P164 and PK4". European Journal of Human Genetics. 19 (9): 1013. doi:10.1038/ejhg.2011.64. PMC 3179364. PMID 21505448. ^ Peter de Barros Damgaard, Nina Marchi, Simon Rasmussen, et al. (2018), "137 ancient human genomes from across the Eurasian steppes." Nature, volume 557, pages 369–374 (2018). ^ a b Cai, X; Qin, Z; Wen, B; Xu, S; Wang, Y; et al. (2011). "Human Migration through Bottlenecks from Southeast Asia into East Asia during Last Glacial Maximum Revealed by Y Chromosomes". PLoS ONE. 6 (8): e24282. Bibcode:2011PLoSO...624282C. doi:10.1371/journal.pone.0024282. PMC 3164178. PMID 21904623. ^ Li, Hui; Huang, Ying; Mustavich, Laura F.; Zhang, Fan; Tan, Jing-Ze; Ling-; Wang, E; Qian, Ji; Gao, Meng-He; Jin, Li (2007). "Y chromosomes of prehistoric people along the Yangtze River". Human Genetics. 122 (3–4): 383–388. doi:10.1007/s00439-007-0407-2. PMID 17657509. ^ "Y-DNA Haplogroup D-M174 and its Subclades - 2017". Edmondson, Jerold A. (2007). Jimmy G. Harris, Somsonge Burusphat and James E. Harris (ed.). "The power of language over the past: Tai settlement and Tai linguistics in southern China and northern Vietnam" (PDF). Studies in Southeast Asian languages and linguistics. Bangkok, Thailand: Ek Phim Thai Co. Ltd.
van Driem, George (2011). "Rice and the Austroasiatic and Hmong-Mien Homelands" (PDF). In N. J. Enfield, ed. Dynamics of Human Diversity, 361-390. Canberra: Pacific Linguistics. Firasat, Sadaf; Khaliq, Shagufta; Mohyuddin, Aisha; Papaioannou, Myrto; Tyler-Smith, Chris; Underhill, Peter A; Ayub, Qasim (2006). "Y-chromosomal evidence for a limited Greek contribution to the Pathan population of Pakistan". European Journal of Human Genetics. 15 (1): 121–6. doi:10.1038/sj.ejhg.5201726. PMC 2588664. PMID 17047675. Fornarino, Simona; Pala, Maria; Battaglia, Vincenza; Maranta, Ramona; Achilli, Alessandro; Modiano, Guido; Torroni, Antonio; Semino, Ornella; Santachiara-Benerecetti, Silvana A (2009). "Mitochondrial and Y-chromosome diversity of the Tharus (Nepal): a reservoir of genetic variation". BMC Evolutionary Biology. 9 (1): 154. doi:10.1186/1471-2148-9-154. PMC 2720951. PMID 19573232. Karafet, T. M.; Mendez, F. L.; Meilerman, M. B.; Underhill, P. A.; Zegura, S. L.; Hammer, M. F. (2008). "New binary polymorphisms reshape and increase resolution of the human Y chromosomal haplogroup tree". Genome Research. 18 (5): 830–8. doi:10.1101/gr.7172008. PMC 2336805. PMID 18385274. Kayser, M.; Choi, Y.; Van Oven, M.; Mona, S.; Brauer, S.; Trent, R. J.; Suarkia, D.; Schiefenhovel, W.; Stoneking, M. (2008). "The Impact of the Austronesian Expansion: Evidence from mtDNA and Y Chromosome Diversity in the Admiralty Islands of Melanesia". Molecular Biology and Evolution. 25 (7): 1362–74. doi:10.1093/molbev/msn078. PMID 18390477. Kim, SH; Kim, Ki-Cheol; Shin, Dong-Jik; Jin, Han-Jun; Kwak, Kyoung-Don; Han, Myun-Soo; Song, Joon-Myong; Kim, Won; Kim, Wook (2011). "High frequencies of Y-chromosome haplogroup O2b-SRY465 lineages in Korea: a genetic perspective on the peopling of Korea". Investigative Genetics. 2 (10): 10. doi:10.1186/2041-2223-2-10. PMC 3087676. PMID 21463511. Ratliff, Martha (1998). "Ho Ne (She) is Hmongic: One final argument" (PDF). Linguistics of the Tibeto-Burman Area 21.2:97-109. Rootsi, Siiri; Zhivotovsky, Lev A; Baldovič, Marian; Kayser, Manfred; Kutuev, Ildus A; Khusainova, Rita; Bermisheva, Marina A; Gubina, Marina; et al. (2006). "A counter-clockwise northern route of the Y-chromosome haplogroup N from Southeast Asia towards Europe". European Journal of Human Genetics. 15 (2): 204–11. doi:10.1038/sj.ejhg.5201748. PMID 17149388. Scheinfeldt, L.; Friedlaender, F; Friedlaender, J; Latham, K; Koki, G; Karafet, T; Hammer, M; Lorenz, J (2006). "Unexpected NRY Chromosome Variation in Northern Island Melanesia". Molecular Biology and Evolution. 23 (8): 1628–41. doi:10.1093/molbev/msl028. PMID 16754639. Shi, Hong; Dong, Yong-li; Wen, Bo; Xiao, Chun-Jie; Underhill, Peter A.; Shen, Pei-Dong; Chakraborty, Ranajit; Jin, Li; Su, Bing (2005). "Y-Chromosome Evidence of Southern Origin of the East Asian–Specific Haplogroup O3-M122". The American Journal of Human Genetics. 77 (3): 408–19. doi:10.1086/444436. PMC 1226206. PMID 16080116. Su, B.; Jin, Li; Underhill, Peter; Martinson, Jeremy; Saha, Nilmani; McGarvey, Stephen T.; Shriver, Mark D.; Chu, Jiayou; et al. (2000). "Polynesian origins: Insights from the Y chromosome". Proceedings of the National Academy of Sciences. 97 (15): 8225–8228. Bibcode:2000PNAS...97.8225S. doi:10.1073/pnas.97.15.8225. PMC 26928. Wells, R. Spencer; Yuldasheva, N.; Ruzibakiev, R.; Underhill, P. A.; Evseeva, I.; Blue-Smith, J.; Jin, L.; Su, B.; et al. (August 2001). "The Eurasian heartland: a continental perspective on Y-chromosome diversity". Proceedings of the National Academy of Sciences. 98 (18): 10244–9. Bibcode:2001PNAS...9810244W. doi:10.1073/pnas.171305098. PMC 56946. PMID 11526236. Wen, W; Hong, S; Ling, R; Huifeng, X; Kaiyuan, L; Wenyi, Z; Bing, S; Shiheng, S; et al. (2004). "The origin of Mosuo people as revealed by mtDNA and Y chromosome variation". Science China Life Sciences. 47 (1): 1–10. doi:10.1360/02yc0207. PMID 15382670. Xue, Y.; Zerjal, T; Bao, W; Zhu, S; Shu, Q; Xu, J; Du, R; Fu, S; et al. (2005). "Male Demography in East Asia: A North–South Contrast in Human Population Expansion Times". Genetics. 172 (4): 2431–9. doi:10.1534/genetics.105.054270. PMC 1456369. PMID 16489223. Bradshaw Foundation. "Journey of Man - The Peopling of the World". ISOGG (2012). "Y-DNA Haplogroup O and its Subclades - 2012". TMC (1998). "Genetic Findings Support 'Out of Africa' Theory". Archived from the original on 2009-10-10. Wikimedia Commons has media related to Haplogroup O of Y-DNA.